300mm wide slip resistant aluminium platform. Locking spring-loaded clips for added safety. When you need low-level access to hard-to-reach areas, step ladders aren't always ideal. Sometimes they're hard to balance on and difficult to place in the corners of rooms - our low level work platforms can help you get to those high corners with ease. They are sturdy work platforms at only 300mm wide; you are able to place them in small spaces to access high places. These are available in two heights; 500mm or 600mm, with a non-slip aluminium platform you will feel secure working on them and they have locking hinges for added safety. 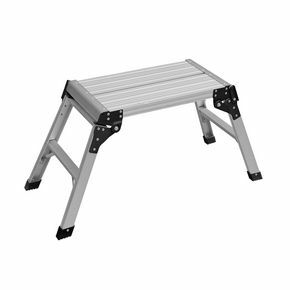 The load capacity is 150kg allowing you to stand on them comfortably as well as having equipment on there, such as paint or other tools. Our products are light weight and portable, they fold flat for convenient storage allowing them to be transported easily in work vans or cars. We are so confident our low level work platforms will suit your requirements that they have a five year warranty and FREE UK Delivery.